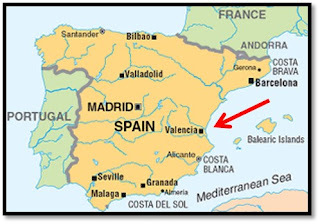 Valencia! 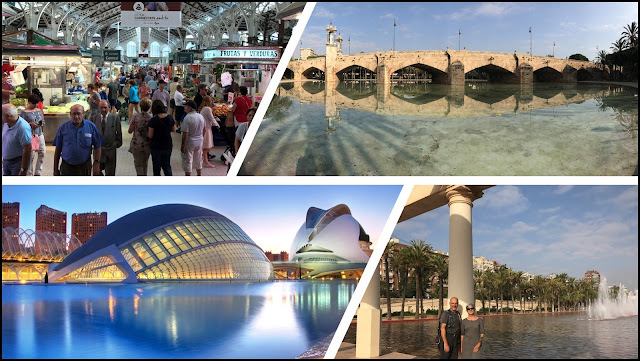 After nearly 3 weeks, we still have about a week left to enjoy Valencia. Already we are talking about coming back to continue learning the language, enjoying the lifestyle and exploring the surrounding areas. But before getting to this interesting conclusion let’s go back in time and revisit the last few weeks. I had asked Julie if she wanted to write the last few blogs without really realizing that I didn’t have much to say. Julie is never shy of words and was happy to lead the charge. 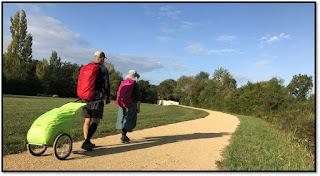 I just lived the journey, put in my two bits in the blogs and reacted to the unplanned elements that seemed to be thrown at us – more during this trip then others, it seems. If I look back at the changes we’ve had to make to this trip, I guess they were unavoidable. But we did accomplish an incredible 900km walk; shared an amazing few days in Switzerland with Augus and Santi and finally, we are living a trial run of something we’ve always wanted to do, which is to experience living abroad. Even though it is a little short, this experience in Spain is only re-enforcing that we want to do more of this. 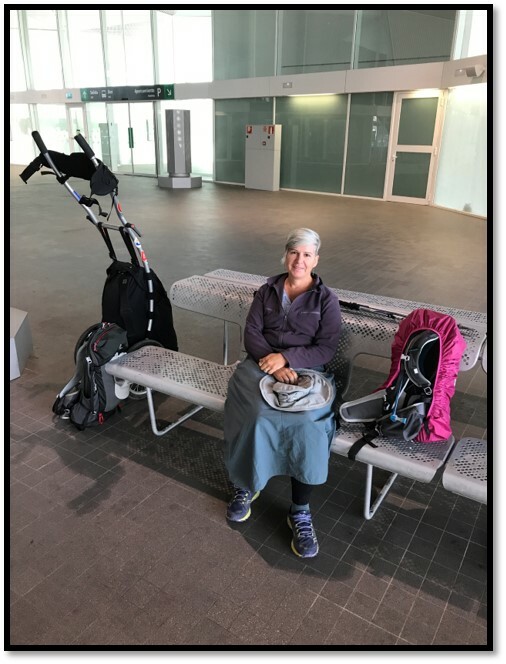 The challenges we encountered on this trip included; shin splints for me at the start, a foot problem for Julie just as we headed to Switzerland – which at the time seemed to be perfectly timed. Later we realized that Julie’s foot was a bigger issue that needed more recovery time, and although minor, I’m now recovering from a cold (hard to believe in this gorgeous Mediterranean weather). On a side note, Julie has one more session with the Physio/chiro/Acupuncture specialist on Friday, she has seen the physio 5 times and her foot is doing much better, thank you. 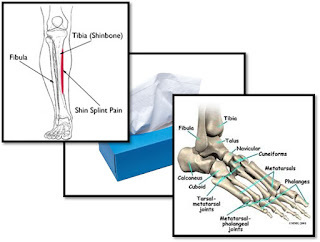 Julie suffered a dislocation, a small bone on top of the foot. The treatment was to walk less, re-train the muscles to pull the bone back in place and most of all - give it time to heal. Firstly, there is no real traffic! It was an ‘AH HA’ moment for me, realizing that there was minimal traffic. The roads are busy, but the rush is experienced on the sidewalks and the bike lanes. Every street has a dominant bike lane, transit goes everywhere and there is a subway system for the broader communities. A classic example of efficiency; Julie and I went to the Valencia CF vs Sevilla FC match last Saturday night. Valencia won, and it was an intense experience as my neighbours kept hugging Julie and I after each goal. We were there with nearly 50,000 spectators. 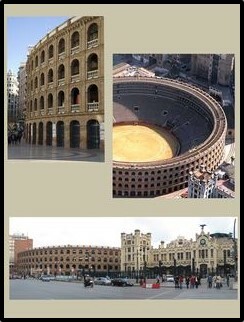 The stadium is just outside of the ‘old town’ but still very much downtown and there are no parking lots in the area. The crowd dispersed itself slowly on foot. It was amazing. We were about 3km from our apartment and, so we walked. From what I could tell, most of the folks who live close to downtown also walked, for several kms fans were filling the streets. Others were on additional buses and subways specially increased for the event. 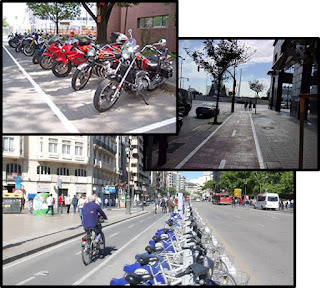 Several other examples of traffic management include; underground thoroughfares, preferential treatment for scooters and motorcycles on roads and for parking. They also have large pedestrian walkways and a vast number of bike rental outposts ‘everywhere’. 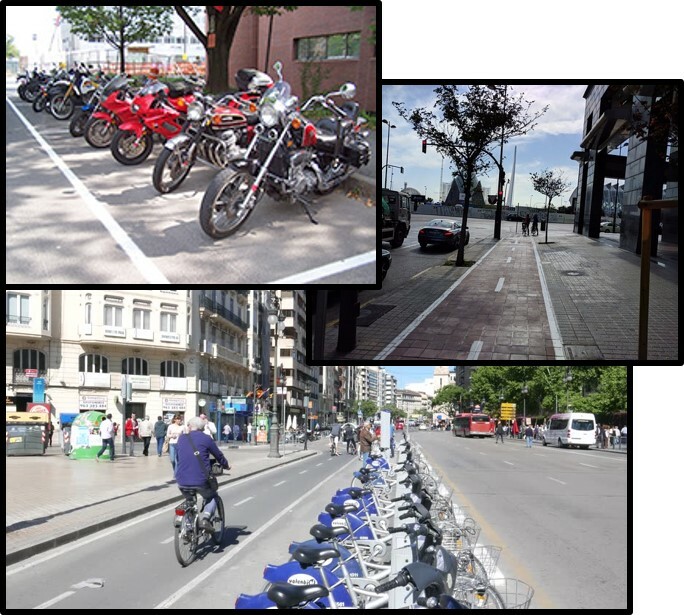 If you drive in downtown Valencia be prepared to give way to pedestrians, scooters, motorcycles, buses, and commercial trucks. That is simply the way it is, so people drive their cars only if/when they have to! Secondly, I’ve also come to appreciate ‘siesta time’. We just didn’t understand this empty 3 hours in the early part of the afternoon. It was the same in southern France; businesses closed during this time. But having spent more time here and living the life of a Valencian, I totally appreciate this time to relax, to catch-up with friends and family, and mostly to re-energize. Julie had a conversation with her physio about this and she (the physio) couldn’t understand why or how someone could work productively from 8- 9am to 5- 6pm (and sometimes later). It does make sense; the mid day meal is their main meal of the day. In the last weeks Julie and I have spent 2+ hours in cafes eating slowly, watching families, working colleagues and friends spend time with each other – not 45 minutes or an hour because we have a meeting at 1pm… No, take 2 or three hours so that you can digest and feel re-energized for another 3 or 4 hours of work after the siesta. I’m seriously going to try and bring that back with me! Well, I should list a few of the splendid things we’ve done. In fact, we’ve slowed down a bit because it’s not a race and we still have a few more days before heading north. Besides, whether we come back here or elsewhere, we’ll be experiencing this again! The joy of re-inventing our daily routine, learning from other cultures how to enjoy life, that is what it is all about! I mentioned earlier that Valencia was established in 130BC – one of the coolest things to do in Valencia is to explore the roman excavations under the parts of the ‘old city center’. Super nice! 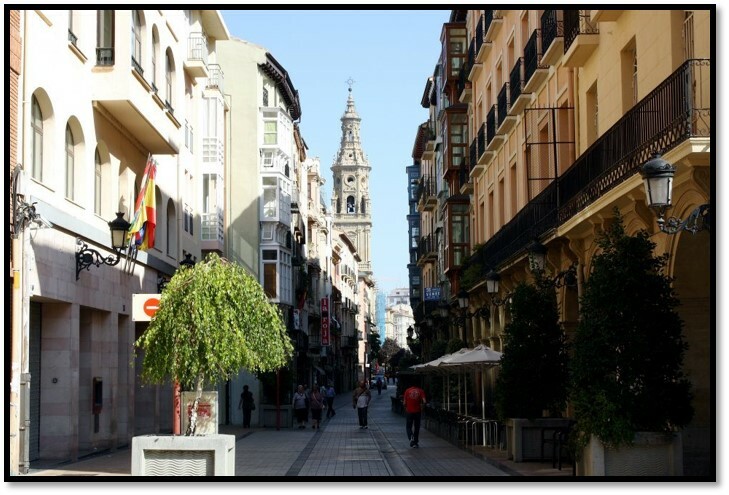 You walk on glass sidewalks hovering and overlooking remains of buildings, bathhouses, kitchens, amazing tile work, and streets of the original Valencia some 2100 years ago. Aside from walking a very large ‘old city center’ which spans probably 2km by 2km. 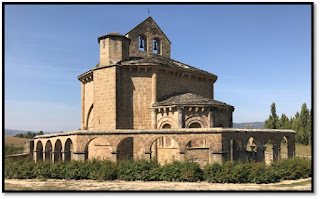 There are countless churches and museums which hit all the periods from the 8th and 9th century to the 13th and finally to the 18th and 19th most are beautifully restored. 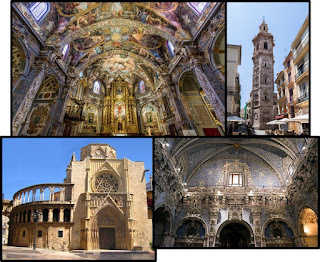 Of note are the cathedrals and two or three small churches (all UNESCO sites). These are simply spectacular. They compare to the Sistine Chapel. It reminds me how the elite of any period enforced the separation of classes through religion (similarities of today?). The North Train Station, the Bullring (third biggest in Spain), the Central Market and the multitude of squares are simply worth enjoying. What’s fairly amazing throughout the town and on these buildings, is the ceramic work. It is a reputation they uphold and almost every building displays usually an old (or new reproduction) of a classic ceramic façade. Some buildings are very ornate while others are decorated simply by ceramic plaques. The Opera Palace (as mentioned on Facebook) is as impressive as the Opera House in Sidney Australia – really! And lucky for Julie and me, we saw Madame Butterfly – one of the best, moving operas we have both ever seen. I could easily go on because there is plenty more, but I could not possibly end before talking about the parks and beaches. They love green space! The main boulevards have center green walkways for pedestrians and cyclists (and parrots). They’ve converted the entire surrounding river valley into a combination sports fields, bicycle/pedestrian paths, exercise stations and kids play parks. A 10km long by more than 100m wide park surrounds the core of the old town. Beside the shipyards and cruise ship docks there is about 20km of beach front. Simply spectacular! Anyway, we still have another five days in Valencia and we are striving to appreciate every minute of it! What a lifetime since our last blog! In Los Arcos, we took a bus into Logrono. Simon had booked us into a nice hotel, the physio had adjusted my uncooperative foot and our rented car awaited us for a trip into Switzerland to cheer our nephew on at his circus competition. How can anything like this occur in a normal life? I was thankful of the rest. Sitting in the car, I watched the scenery roll by. 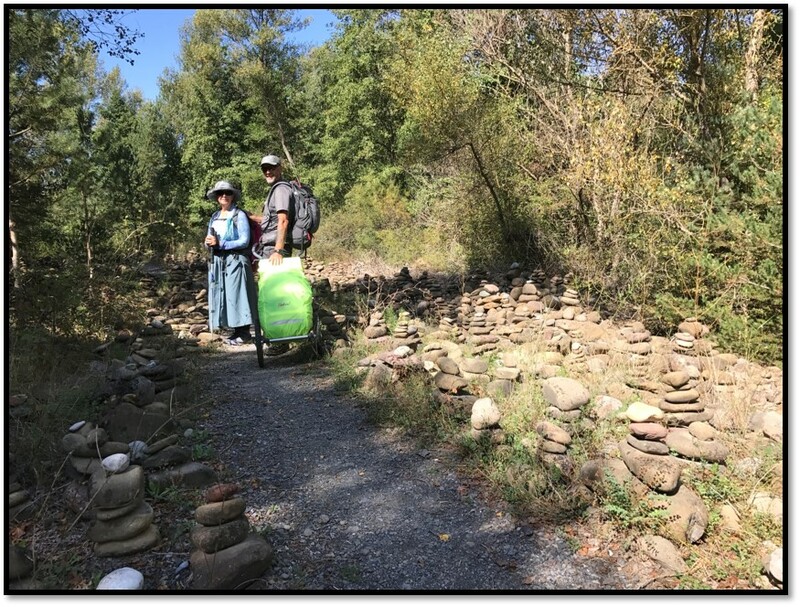 We were reversing our steps back out into France toward Lyon, where Augustin and Santiago would arrive. It took two days of driving to reverse what had taken us 40 days to walk. How amazing to float so fast on smooth roads? We recognized the terrain and the towns that swiftly whizzed by. We greeted the young men at the airport, and the four of us drove toward Switzerland. 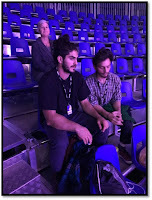 Augustin and Santiago are students at the circus school in Quebec City. They are a team that work their magic on the Chinese mast. They combine supernatural acrobatics on the mast and a gentle type of humour that is all their own. They applied and got accepted in this circus competition. We felt just as excited as they were. We spent most of Friday and Saturday at the competition. We watched the athletes do their practice runs, the initial selection, and the first gala event. We were thrilled to find out that the boys made it into the final gala on Sunday. We loved being there. The technical work to set up the stage for each athlete, the volunteers working tirelessly, the judges, the competitors – some as young as 6 years old. Many students of the various European schools and others professionals from Eastern Europe and elsewhere. We decided we would stay for the final gala on Sunday. What a treat. Augustin and Santiago were voted the best team by the organizing committee and they also finished second with a silver medal in the 18+ open category (beating some very good professionals)! They were on a high when we left them to celebrate. There was a line up of new friends and fans wanting to take their photos and congratulate them on their performance. Prepping, many performances,,, and a few awards! 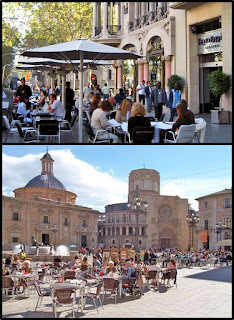 A quick reversal of the drive found us back in Logrono where we returned the car. I (Julie) was very nervous about my foot. It had not been tested during these past days. 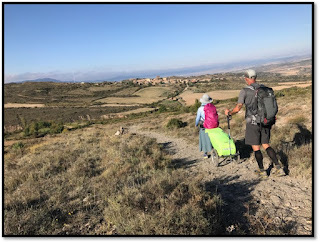 We packed our bags and Simon pulled Whilomena as we left early morning to resume the Camino. With each step, I knew this was not going to happen. But I tried to alter my cadence, my foot placement but to no avail. Less than an hour into the walk I had to admit defeat as we were leaving the city. I was not able to walk. It was painful returning back into town. Both physical pain and a sense of failure loomed over me. I tried to keep a brave face on and wished the walkers a buen camino. Foolish pride was my constant companion that day. As for the long walk? It has proven challenging for both of us in ways we did not expect. The mood of the different folks we met along the way, our physical aches and pains, our struggles and frailties made this trip different then the last ones. It gave me pause about our plans for the Great Canadian trail. We will have to research it well and have alternate routes planned, just in case something happens. I for one feel more vulnerable now. Doubt and fear of injury have come into my consciousness. We picked Valencia - warm and by the Mediterranean! 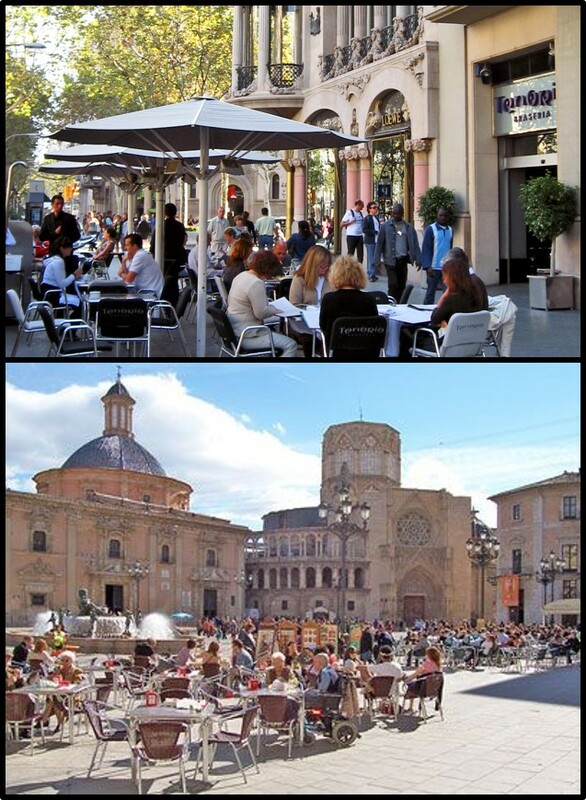 Simon suggested we stay another night in Logrono, and brain storm what we could do as we had a month before our return trip back home. Returning to Canada early didn’t really exist as an option we considered. We did consider changing our flights so that we could spend a few days in the Ottawa region on our return but that was a no go (don’t get Simon started on that topic!). 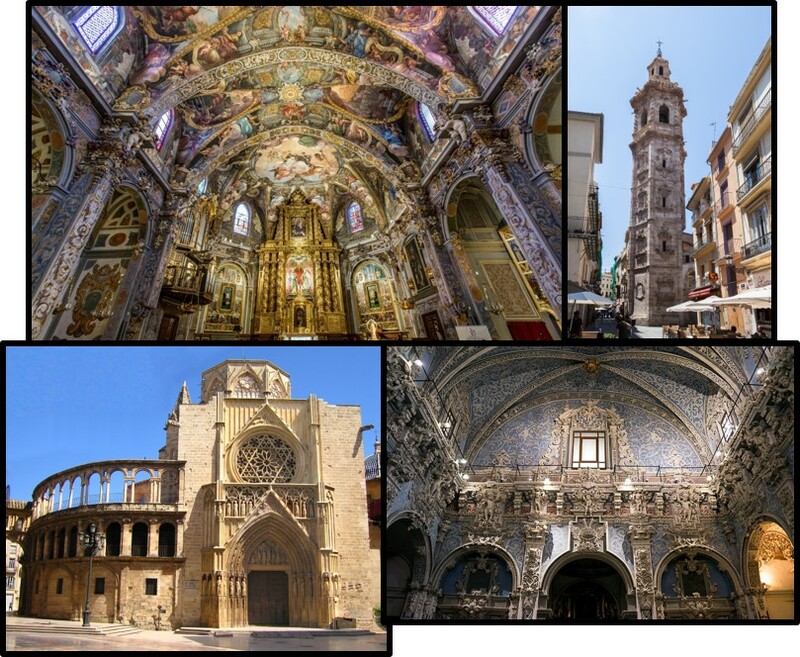 We decided to find a city where we could rent an apartment and explore life in Spain – Valencia was chosen! It is a large city (near 1M) along the Mediterranean, lots of history, and many options for rentals. The king of finding the best deals, AKA Simon, found us a studio, with kitchen, near the center of the old sector. We’ve been here for four days now… Each day we choose a Spanish recipe for dinner, go to the market to purchase the ingredients and walk around a bit. It has been quite lovely. We get to practice my Spanish, we get to see an amazing city, and find out what life is all about. A truly beautiful town with so much to see and do! We’ve been chatting about spending time in southern France, Spain or Italy to discover the tempo of life in southern Europe. This is an ideal opportunity to do just that. It is truly a gift to have Simon along. He changed his focus and made a difficult situation an opportunity of a lifetime and for that I am truly grateful. 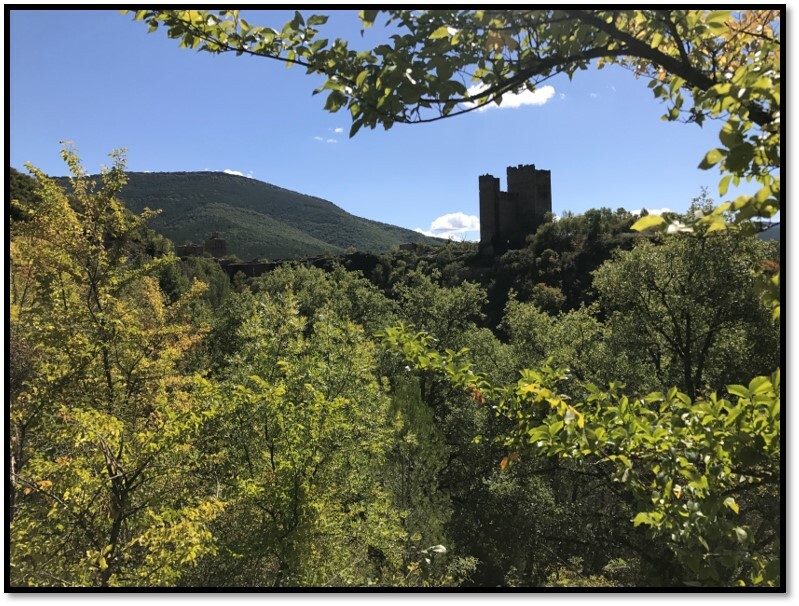 Sanguesa to Monreal: 29km. I’ve been looking for something since we started. This feeling of Bliss we both felt during the last Camino and in Arizona. Both walks were very different but the feeling of a clear mind, a simple routine, and a sense of happiness not associated with anything in particular was prevalent. Slowly, since crossing the border it has come back. The walk in this section was very rough. The trails were rocky and narrow; the weather very hot and sunny. Pulling Whilomena was a challenge, but somehow, we both felt strong and cheerful. Our conversations turned to topics of life choices, possible transitions to the next life venture and family and friends. The other folks on the trail also commented on the difference since crossing the border. 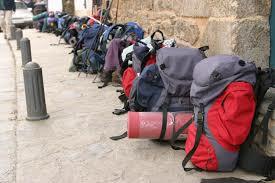 We are all in a similar age range and possibly the Camino has attracted us here for similar reasons. The Way has been historically about renewal. Prior to it being a Christian tradition where sins and crimes could be forgiven, it was a pagan tradition. One would walk to the end of the world (Finisterre), bathe and burn their clothing. They would return home cleansed. The act of walking long hours every day for many days is simple but effective. First, walking causes physical pain. 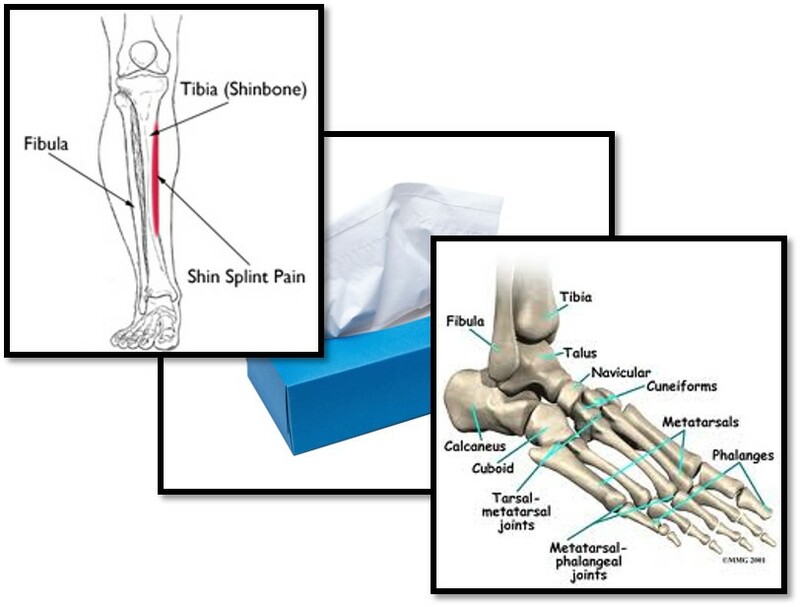 We see the ‘new’ walkers limping with their blisters and sore muscles. They often also have heavy bags. They carry too many things, clothing, toiletries, books, etc. One focuses on the physical pain. It is all consuming. Slowly it lessens; the body gets fitter, stronger. Those that have passed this stage, walk with more ease. They economize their movements. Their minds are finally free to focus on their inner experience. Moods swing from anger to sorrow to peace and back. They can sort their thoughts and let go of what is no longer useful. Oddly enough, they also get rid of those extras they had shoved into their backpacks. We recognise each other. Our clothing and shoes are more worn, but our smiles are brighter. Bad trails, good trails, easy trails! We are just starting the third stage, I think. Time has become non-linear, more natural. We start our days just as the sun rises, and walk into the afternoon. Only when our bodies tell us it is time to stop do we look for a shelter. Distances and destinations are less important. All activity is automatic, freeing some part of our mind to wonder. Bliss. Monreal to Obanos: 27km. This is where the Camino Voie d’Arles (Via Aragones) joins the Camino Fances. We are seeing many fresh faces. It is the end for another group, and just the start for others. The trail challenged us for hopefully the last time. The first half of this day was in a very rolling, narrow and bouldery trail. A parting gift! We see a small chapel approaching Obanos – we recognized it from our last Camino Frances walk. A few pilgrims were sitting by the chapel and looking at their sore feet – they’ve been on the road for three days and the pain is just starting – we’re well past that! Obanos to Villatuerta: 23km. Our first full day on the Camino Frances and the trail is good to us. Some steep hills (Simon likes that) but the trail is wide and mainly smooth. Ah yes, we remember a few spots – deja-vue(s) on a regular basis. But mostly we exist in our heads and we chat about broader topics. I think we’ve solved a few critical life and world issues. We’ve also designed a house, created a perfect garden, and planned many more trips. Work is far from our thoughts; to continue working for both of us means to find fulfilling activities. Villatuerta to Los Arcos: 27km. It all started so well. We were flying! Passing pilgrims; feeling strong. I (Julie) had been feeling some minor pain on the top of my left foot. It only bothered me at night; I couldn’t find a comfortable position in bed. This morning, I thought I would put some Kinesio tape on my foot and leg in the hopes it would help. It was going great until an hour before getting to Los Arcos. Then a thunderbolt exploded in my foot. Pain searing up my shin and all over my foot. I kept the fast pace and with adrenaline pumping managed to get into town. Then I was hobbled. We found our albergue and I went straight to bed and stayed there. It was a terrible night. I barely slept due to my pain and my worries. The trail gods had played a nasty trick on me. We looked for a physio in the next big town, Logrono and found a few near the bus and train stations. Simon booked a hotel near by. Dry spot on the way to Los Arcos, the 10th Century bridge into Los Arcos, typical desert scene mid afternoon (siesta time). 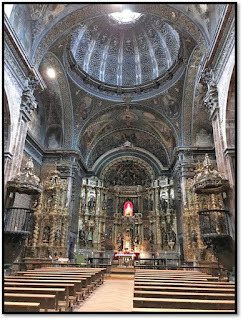 Cathedral in Los Arcos - Gold Plated! Los Arcos to Logrono: 29km in bus. The morning found me with a slightly swollen foot and lots of pain. Simon decided to accompany me to Logrono, and assist me in whatever way he could. I was very disappointed but walking was not an option. Arriving into this big town, we dropped Whilomena at the hotel, and walked to the first, then second, then third physio clinic. The third physio could see me at 12 and she spoke French very well. What an amazing coincidence. She was lovely and worked on my foot and leg for an hour (40 Euros). Her recommendation, rest, ice, and stretch. I asked about wine, and she agreed with me that it should be part of the therapy. She thought I had developed some form of tendonitis of the muscles of the lower leg. We had already planned a stop here in Logrono. As mentioned in a Facebook post, my (Simon’s) nephew Augustin will compete in Milvignes, Switzerland. The hotels, and travel plans were already in place – so, we will do just that. Julie will rest and watch the scenery roll by as we head East through the Northern Pyrenees and central France. We will celebrate with Augustin and Santiago (his cohort) and come back to Logrono in about 6 days. Looking forward to Switzerland for a few days! No decisions need to be made until then. Although the last few days (and the first few on the Camino Frances) have been a little odd. We felt the bliss of walking but also felt the pressure of the crowds. The Camino Frances has become a trendy thing – it’s the only way to describe it. 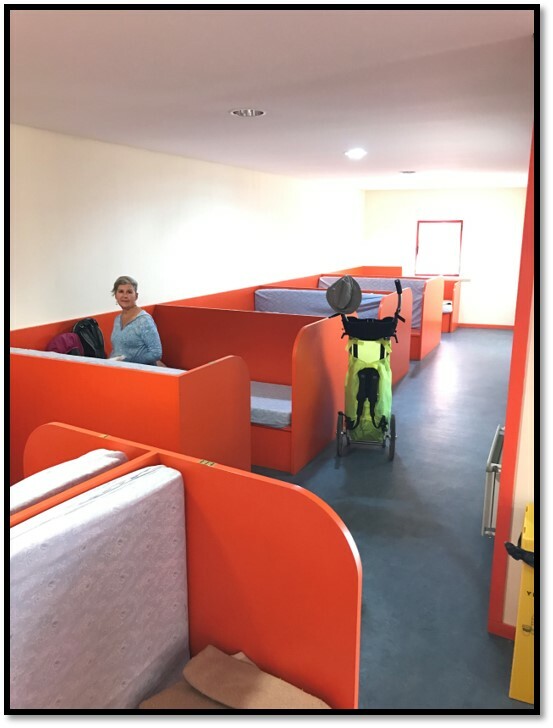 Lots of people, mostly talking about which albergue to reserve and how fast everyone can leave in the morning in order to ensure a place in the ‘good’ or ‘popular’ albergues. 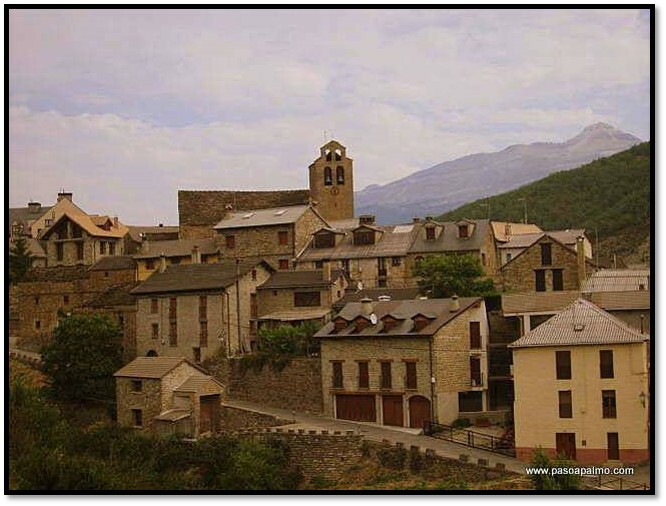 We were debating (after Switzerland) whether to return to Lescar and head East on the Voie de Arles (Via Aragones). There would be fewer people – not sure – we’ll see! At the border, there was a bar! How European of them! No border patrol, just a bar. We stopped with all the other tourists (all coming by car or bus) and admired the view. The Fanta Limon tasted really good. A lady sat next to us and began talking. Not a clue. Habla mas despacio, no intiendo! I was finally able to explain what we had done, and what were our plans for the next month. It was a sign of what will be happening from now on. The descent into Canfran Estacion was uneventful. We walked along the Hwy until we found our albergue, the Pepino Grillo. It was an old house with very uneven stairs. We, of course, were lodged up three flights of stairs in the attic - but the room was clean. Our dinner was cold cuts, cheese, bread and olives. A feast for those hungry and tired. Breakfast was part of the service at this albergue. We were up and ready by 7:30 and shared coffee and bread with jam with two French ladies. Canfran Estacion to Jaca: 27km. What a spectacular day. We followed the National Hwy for a bit then turned onto dirt tracks to reach the valley as we admired the mountains. It was mostly downhill. We walked through an ancient village that if it were in France, it would have been voted one of the prettiest. But being Spanish, it was just another town. The locals were holding a marathon and we had to cross the finish line which was on the Camino. We stopped by the finish line and had lunch while watching a few runners finish the race. There were a few elderly folks watching us descend the road, we stopped and had a ‘conversation’ with them. They wished us a Buen Camino and we walked on. There is a different feeling here in Spain. There are fewer hikers, it is less traveled and less trendy. 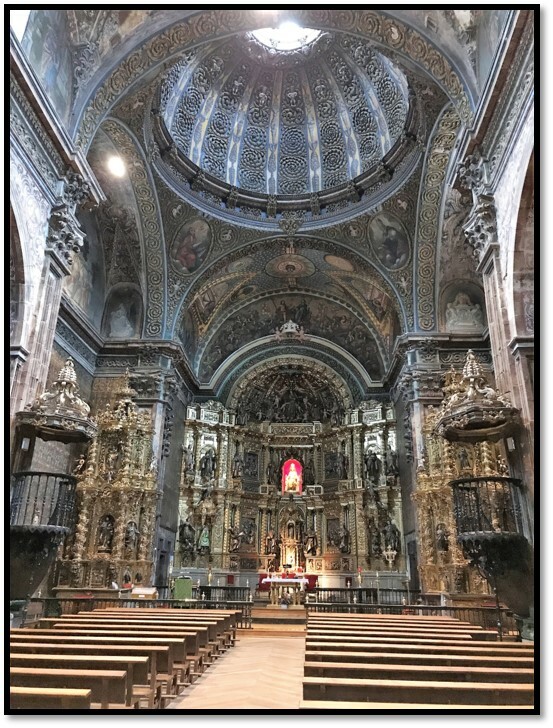 We are starting to experience a bit more of what we had last time we walked the Camino. This walk is more than just hiking. It is about reflection and meditation. I think, folks here get that. We got to Jaca, a large city with an old fort and cathedral. We did some visiting, found a grocery store with veggies. We stayed at a communal albergue with a kitchen; we made a jambalaya! Our companions are: a German man with a heart condition (why is he hiking in the mountains we have no idea), three Italians we’ve been following since the Col and two Spanish guys. Two snored. Ah, I remember why we chose private albergues. Not much sleep to be had here! Jaca to Puete de la Reina de Jaca : 24km, mostly easy walking. We followed a parallel dirt track to the National Hwy again - sometimes on the shoulder of the Hwy. Not inspiring, but our spirits are good and the weather is sunny and warm. 24km seems like a short day. We arrived at the hamlet and found that it is just a bit more than a truck stop. There was a restaurant, a hotel, a small grocery store and a gas station. The apartments all look vacant. But our hotel room had a bath! We made a mixed meal with veggies, bread, cheese, and sausage and regained the lost sleep from the night before. 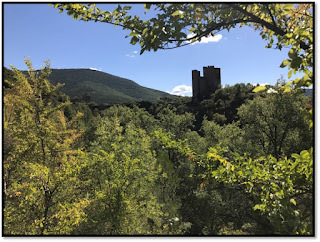 Puenta de la Reina de Jaca to Ruesta : 31km. OK, our old guide book is not very good. The maps are crap and the distances not so accurate. Today was supposed to be a little more than 25km, but it was much longer. Simon was on some kind of high. When he saw a hill, he would speed up. Needless to say, I let him have Whilomena on the tougher hills just to give him the satisfaction. We met more folks that had stayed a bit farther the night before. The Camino followed dirt tracks, then a trail through the woods, then it became narrow and rocky. We wanted this day to end. It was getting on in the afternoon and it was hot. Finally, we saw the hermitage that was situated just before Ruesta. Imagine cresting a hill and seeing and old fortress on cliff. It was breath taking! Ruesta used to be, in the 900’s, a busy place that offered all services to travelers. It is now in ruins. The only buildings that are manned are the two albergues and bar. We asked for a private room and a demi pension. For 51 Euro, we had a lovely room for two and a great three course meal with wine. Our diner companions were 2 French ladies doing the Voie de Arles, 2 French men doing some other trail, 3 Spanish men, our 3 Italians and a cyclist (origin unknown). The conversation was lively and we thoroughly enjoyed copious amounts of food and drink. Ruesta to Sanguesta: 25km. Everyone got up when the 2 Russian ladies got up. They were banging around, talking loudly to one another at 6am. Not proper etiquette for an albergue! Breakfast was… you guessed it; bread, butter jam and coffee. As a special bonus, we also had one slice of American cheese and pastrami. Today’s walk was to be mostly downhill, except for one uphill at the start. It took us an hour and a half to climb up the hill… roughly 5km and 400 m elevation gain. We were treated to spectacular views when we did reach the top. The rolling hills were dotted with abandoned homes here and there. Our destination for a break was this fantastic village on top of a small hillock. Again, we commented that it would make the top villages if it were in France. To reach it we walked on another Roman road. It was bumpy and very uneven, but it was marvelous to experience this part of local history. The rest of the day was smooth easy flat walking. The entry into Sanguesta was through a rough part of town, but the historic part of town was worth the visit. We left the Voie Le Puy en Velay to join the Voie d’Arle. The bus ride from L’Aire sur l’Adour to Pau took about an hour and a half. From the train station, we took a short cab ride to Lescar, where we joined the GR 653. Once at our hotel we went for a long walk through town (Lescar) in search of a meal – it is Monday, after all, and everything is pretty much closed (like Sunday). We’re used to this but it doesn’t make it any easier. In bigger towns, we know we can find large grocery stores or brasseries/restaurants but Lescar is a suburb of Pau and is smallish. After 3km or 4km of walking we saw a man walking on the road with a baguette – we asked and found a nearby bakery where we bought bread and a pizza for the following day’s lunch. A few blocks away we found a Chinese restaurant and decided to give it a go – whooaa, what an experience. The food was OK, it was ‘buffet style’ and it was an odd mixture of sushi, dim sum, American style Chinese food, and fresh satay style. All and all, a good choice just to switch it up a bit from the French cuisine! On Sept 19th, we walked to Estialiesq (22km); The rain clouds have moved on and we are enjoying cool and sunny days. The walking seems easy – likely because we are now ‘in the zone’. 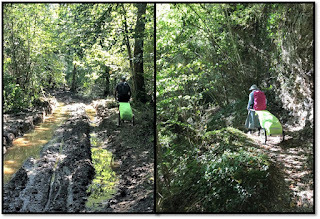 But the trail is still very muddy from the three days of rain we’ve had. Every day we stop at the village square before heading to our host so that we can clean the wheels, covers, and shoes. You can waste your time avoiding mud so the easiest is to get it done and wash/wipe things after. Our choice of accommodations in these smaller town is limited but we have been pretty lucky with our choices so far. In Estialiesq (don’t even try to pronounce it), we stayed at the Maison Milord. Francoise and Francois are supper nice and open. Once again, we get to discuss our goals for life; how to simplify and be happy. They too have left their busy lives in the ‘big town’ and found this ideal farm for their bed and breakfast. We are alone for the evening and our diner is served on a deck overlooking the valley and the mountains. She was a great cook and we had fresh salad, curry pork, and her own apple flan recipe – most of the ingredients were from their garden/farm. We finished our wine watching the sun set. Very romantic. Trails... the good, the bad, and the ugly! Estialiesq to Eysus (20km); The Voie d'Arles seems much less walked, still no pilgrims to be seen! That said, we seem to be stopped by more people who are interested in our journey and we are hitting ‘chambres d’hotes’ and gites that are over the top friendly and inquisitive. 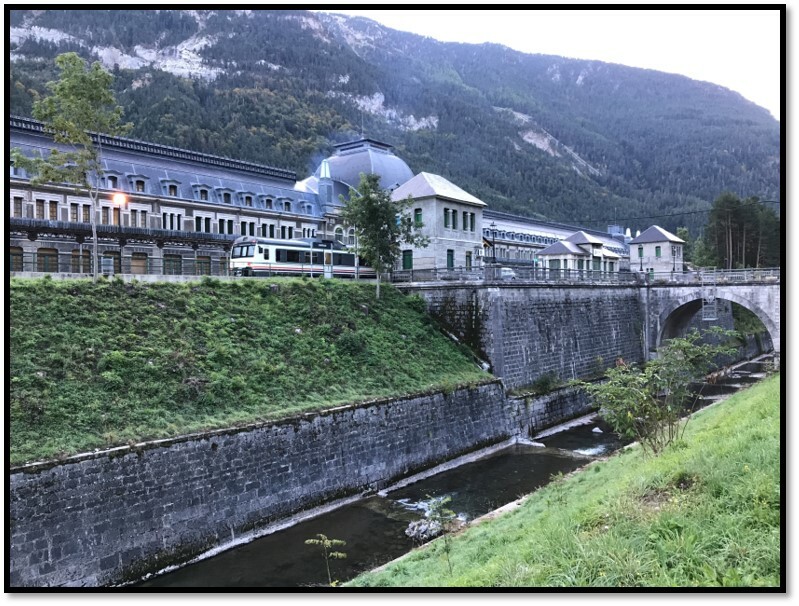 We stayed at the le Moulin d'Eysus. Our host is a funny guy and his spouse Jacqueline was talkative – we had another lovely chat about life decisions. We had a simple but good meal, the room was decorated to the max (no doubt by her). Eysus to Bedous (23km); A later start and another conversation over coffee found us walking deeper into the Pyrenees. The trail rolled up and down ridges of the foot hills. It is hard to get the Wheelie off of Simon as he loves the up-hills. Oh well. During our walk, Simon’s phone rings. It is our host for this evening. Are we coming? When? Could we come at 5pm? We soon forget the odd conversation and resume our walk in this forested trail along a beautiful mountain stream. We arrive in Bedous early. We visit a bit, buy some provisions, have a cool drink at the café and then go and find a spot for my afternoon nap. A bit more waiting brings us to 5pm. 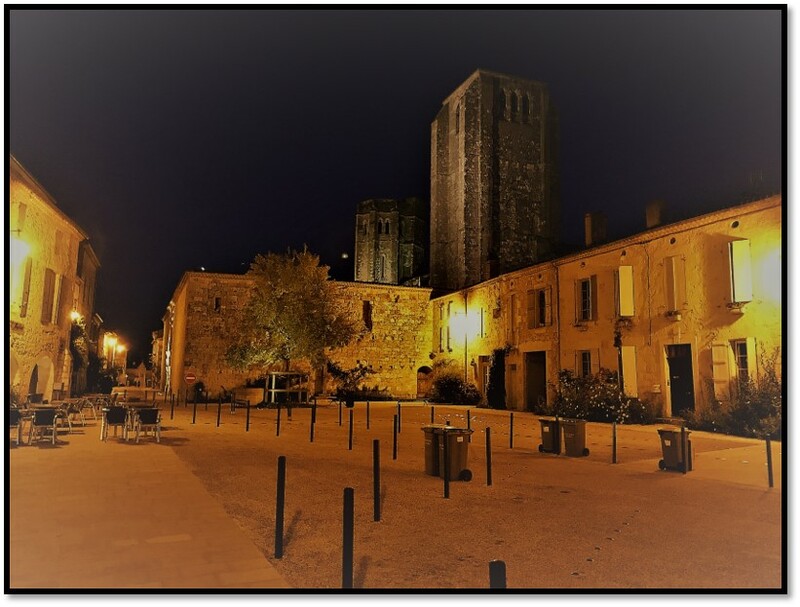 Our Gite 'Moulin d'Orcin, the beautiful town of Bedous, and a good part of the trail! We arrive at the Moulin d'Orcin. It is a beautiful spot along the same stream we have been following all day. No one is around. We ring the bell, we wait, ring the bell again, we phone. Nothing… Oh oh… Finally, a woman pops her head out of the window: ‘are you waiting for someone?’ Yes, we have a reservation… Oh, my husband is away in Spain… He is not here… She finally comes down and shows us to our room. We are staying in her children’s room. Her home is a mess; dirty, piles of clothes everywhere, dirty dishes in the sink. This is not a good start. There are clean sheets on the bed, and a shower (no shower curtain) and we are assured we will be fed tonight. We feel stuck so we decide to make the best of an uncomfortable situation. The husband arrives around diner time (7:30). His wife has made a delicious diner for her family. We are dining with all of them and their border, Loren. It was an odd evening, they were nice but did not seem to understand their role as our hosts. We just seem to be in the way. Every move we make is commented on: are you going to eat all that? Don’t you like the cake? They hover uncomfortably. The price for the privilege of being with them in their home? The same as we paid for a fabulous suite and romantic meal at the Maison Milord. Let’s hope we don’t have too many of these evenings! Bedous to Urdos (7km plus a bus ride); It was raining, a lot. There was lightening in the morning. We can’t wait to leave our accommodations. We have decided (as suggested in our guidebook) to walk to Accous and take the bus to our destination. Most of the day follows the National Hwy. and it deemed fairly dangerous. A short walk gets us to the bus stop and we wait for an hour. A quick bus ride through more stunning terrain gets us to this beautiful little town of Urdos. We could be anywhere in the European mountains. But miracles of all miracles, there is a grocery store (open), a restaurant (open) and our host at the communal gite is more than happy to let us in early! It is clean, warm, and the kitchen is well stocked with all sorts of niceties such as tea and coffee. After yesterday, this is so appreciated. We will rest, wash our gear and get ready for the Col de Sompor (and Spain) tomorrow. These last few days have been about walking in rolling hills through vineyards and sunflower fields. This is to say that we've not only had superb food but also very good wines. The Malbec of the Lot Valley was great and now we are in the Armagnac and the Gascogne area - in the Gers Region. Lots of good reds but also some surprising whites and fabulous (light and dark) rose. We are trying a few! Castet Arouy to La Romieux (on the 12th of Sept) was a warm, sunny and long day. Simon and I are in our groove. We are managing 4.5 to 5 km per hour. It is our natural pace. We cross rolling farm land with small hamlets and villages. On this day, we cross two of the ‘most beautiful villages of France’. Lectoure in an ancient Galo-Roman village that became a regional capital in the middle ages. We stopped for a cool drink and enjoyed the sunshine. We are meeting new people. Another Australian couple, an Austrian and of course more French folks. A few more hours of walking got us to La Romieux. 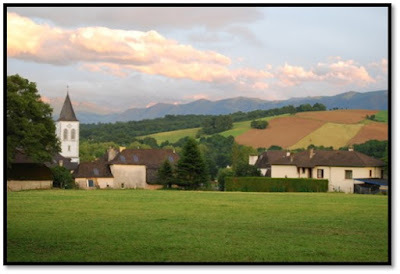 Our gite is privately owned and is out of town. It took us some time to find it. We had to walk the last kilometer twice as we got inaccurate info from the locals… But once there we were thrilled! We had an old house to ourselves. A washing machine, kitchen, salon and bedroom. Our host informed us that she reserved at the local restaurant and would drive us there and back. demi-cuit foie gras and ris de veau! Dinner at Chez Antoine, was quite the affair. We both ordered the Menu Gascogne. As an entrée, we had a lentil salad with demi-cooked foie gras. How to describe the texture… Imagine a lump of soft fat deep fried (of course) in Duck fat. It was as disgusting in texture as it was delicious in taste. Second course came, ris de veau (we had no idea) and it looked good! Some kind of veal in a sweet plum glaze with sweet potato mash. The meat was perfectly cooked, but we could not identify the cut. After the meal (thank goodness) Simon researched what the heck is ris de veau. It is (sit down for this) the veal’s thymus gland! Had we known we would not have ordered it (maybe Simon would’ve); but it was delicious. Desert was a fancy apple pie with phyllo dough. After such a fabulous meal, we slept well. Condom (I know some of you are snickering, but it is not spelled with an m) to Lamothe was 27kms. We managed it well. The weather is changing and we were told that if we could see the Pyrenees (which we could) it meant rain (which it did). On this day, we got rain as we got to our gite. Lucky as it was big rain. Our hosts were really welcoming. Elena and Alain were made to be hosts of an inn. We felt at home right away and they went out of their way to make our stay comfortable. We were joined by a few of the same folks we’ve seen in the last few days. It gave us an occasion to get to know them better. Dinner was a great soup, lasagna and chocolate mousse. I am talking about the food because: it is the French thing to do and because we are getting pretty hungry. The night was not so good as we shared a room with four other folks, who snored. A bit of rain in the last few days... good weather for slugs! Lamothe to Nogaro was another long walk of 28 kms. All went well, more rain, wind and mud. We loved it! It is energising to walk in this stormy weather. Some trees came down during the night that we needed to hurdle but all went well. As we approached Nogaro we could hear this thundering sound. Who knew this town is famous for racing – the Paul Armagnac Course? 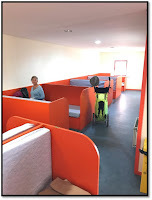 Our gite was part of the communal center and therefore right next to the tracks. We were blessed with the roaring engines from 3pm to 6pm. We were on our own for dinner, so we made a veggie stir fry with pasta. Simple but delicious none the less. 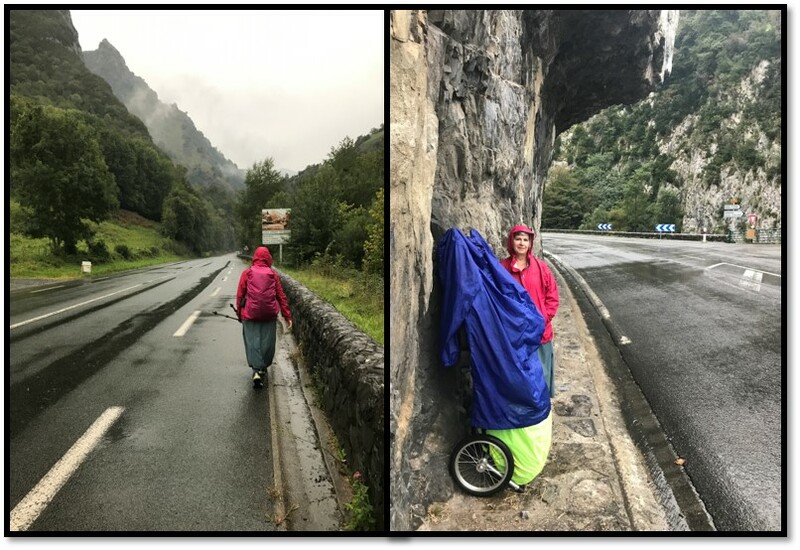 At the communal table, we met an amazing lady, Natasha, who was walking from Bordeaux to Lourdes. Another pilgrimage. She was a journalist, world traveler, and very interesting. We shared our dreams for our lives, in an honest conversation. Funny how we can meet someone and in a short conversation make a striking connection. We wish her well on her journey. down trees on the trail, Julie draws her sword, and walking toward rain! We were not sad to leave Nogaro to walk to Aire sur L’Adour. This 30-km walk will be our last on the voie Podeisis. It was a long and rainy day. 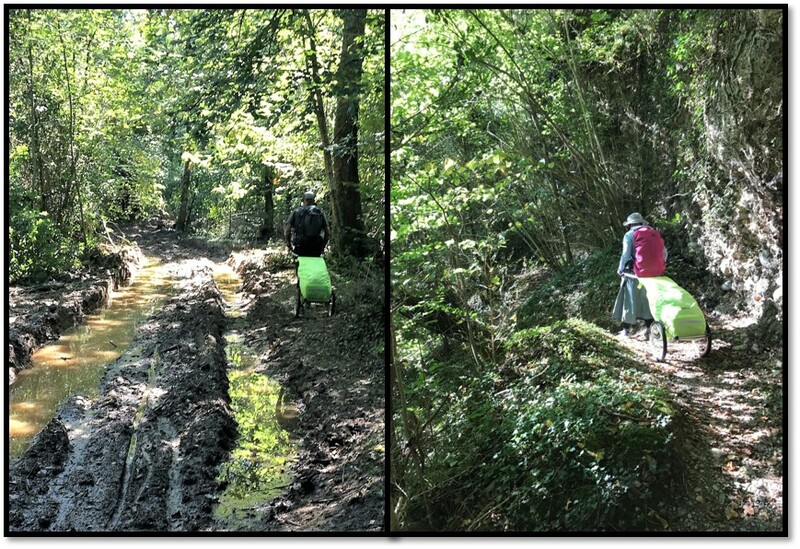 We were muddy, but in good spirits when we found our gite, la Maison des Pelerins, at 3pm. It was a full house with lots of familiar faces. A great opportunity to say goodbye to these fine folks. Tomorrow we take a bus to Pau and then to Lescar, where we join the Voie de Arle through the Pyrenees before joining the Camino Frances in about 12 or so days.